As a cousin to the Reebok All Terrain OCR shoe, the Thunder has some family resemblances, but differs in several characteristics. The distinctive bright colors invite comments from everyone who catches a glimpse. If you like attention-getters, these will do it for you. The shoes aren’t super heavy, weighing in at 11.4 oz for men and 8.8 oz for women. A few jaunts in the stream behind my house confirmed that the built-in drainage ports dispel water quickly. That’s where the similarities with the Super end. 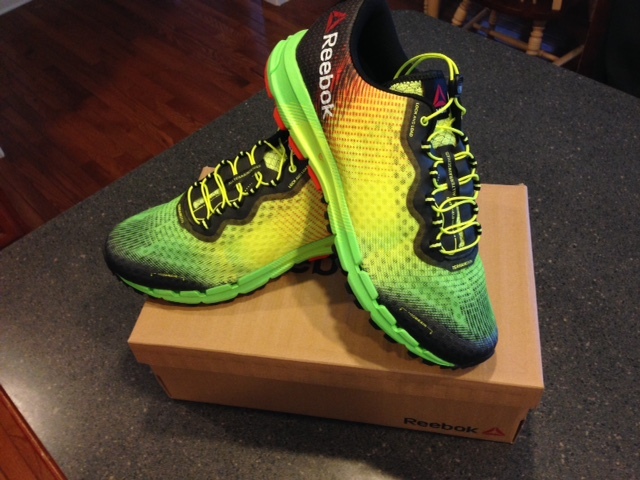 As opposed to the aggressive lugs of the OCR shoe, this one has much more of a trail running traction design. Plenty of grip for off road, but subject to a little slippage when climbing steep muddy inclines. 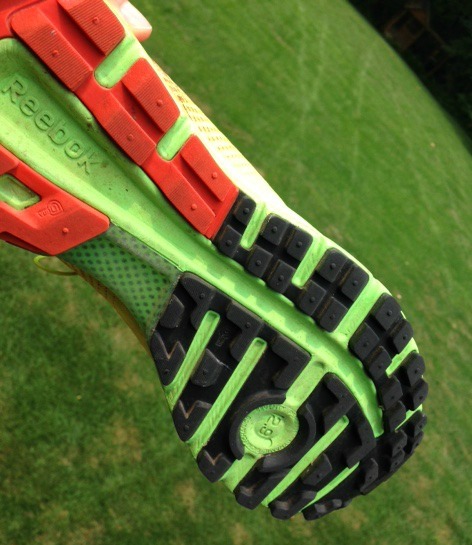 Reebok incorporated a speed lacing system very similar to Salomon lacings. The biggest difference with the OCR shoe is the Thunder ventures away from minimalist tradition by adding substantial cushioning and a 12 mm drop. I should have paid more attention when I agreed to test them because I have long since transitioned to a smaller drop. The large drop prevents me from adopting them as a racing shoe, but I will admit that the cushioning makes them one of the more comfortable shoes I own. In fact, they are now my pre- and post race shoe as they are perfect for wearing around a muddy festival area after your feet have been beaten up by a hard race. While marketed in some respects as an OCR shoe, my overall opinion is that they are much better suited for trail running than OCR. The traction, cushioning, and heel-to-toe drop differ from what many obstacle racers prefer. Could you wear them in an obstacle race and be fine? Certainly. But while they are better than most shoes that newbies wear to race in, there are other shoes more suitable for obstacle racing – such as the All Terrain Super for those who want to stay in the Reebok line. If you are okay with a 12 mm heel drop and want a comfy shoe to go trail running, then you could be very happy with the Reebok All Terrain Thunder. Disclaimer: Reebok provided these shoes to me free of charge, but I was under no obligation to provide a positive review. Next Obstacle racing charity “For Those Who Would” has launched! This is an excellent looking shoe. However I do agree that a lot of us obstacle course racers and mud runners lean toward a different drop. Minimilst shoes tend to take the cake for durability and the feel a lot of us are looking for.